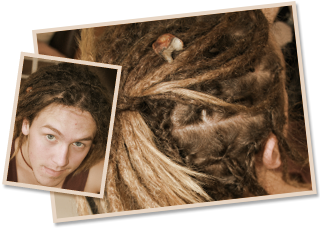 A very special design feature in our dreadlocks is the range of structures we can create for you. 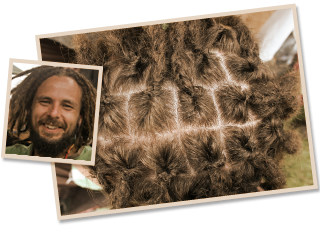 Your dreadlock structure refers to the pattern of the dreads formed at the scalp. Even though your structure is only clearly visible for the first two or three weeks, its effects on the way your dreads sit on your head are lasting. A basic, square structure that is suitable for men and woman and suits people with a naturally centred part, round face, thick hair and circular hair line. This is also the fastest and most cost effective option. However, can look a little harsh and give a flat-headed appearance. A soft and feminine look, preferred by women, usually parted at the side and softly curving backward. Suits long, narrow faces and square hairlines. 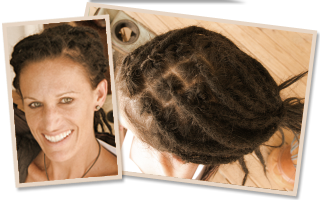 The body of the dreadlocks are balanced but spiral around the head for a very flowing, stylized appearance. A popular choice among men, the versatile diamond structure gives a natural looking body and a full shape, great for styling up, suitable for all hairlines and is fantastic for disguising a reseeding hairline. Can be zigzagged down the middle with no flat head look. 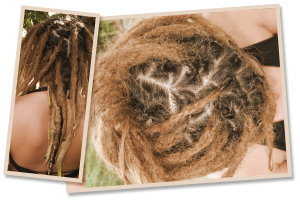 A variety of shapes and sizes to suit a varied size and shape of dreadlock. We make sure it is comfortable with no large dreads behind your ears which may push them forward if you have thick hair.